Hollybeary Creations : 'Tis the Season to get Shaking!! 'Tis the Season to get Shaking!! Happy Friday everyone.. Sorry about the lack of posting our internet has been acting up again and I'm not able to upload photos until wee hours of the morning and I just can't stay awake till then during the week. 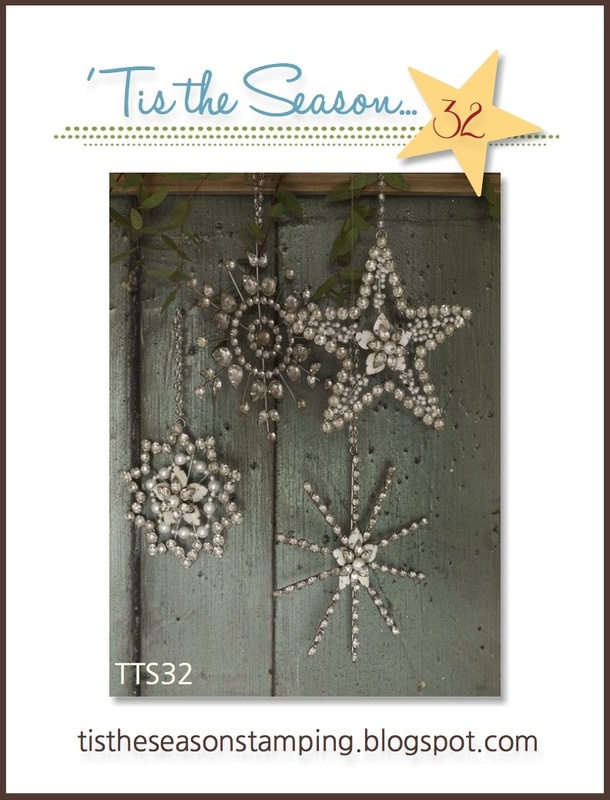 This week at 'Tis the Season we have a fun new Inspiration challenge for you! And I created a fun shaker card. I started with a pool Party panel and I stamped the Woodgrain background onto it in Basic Grey and then I sponged around the edges. 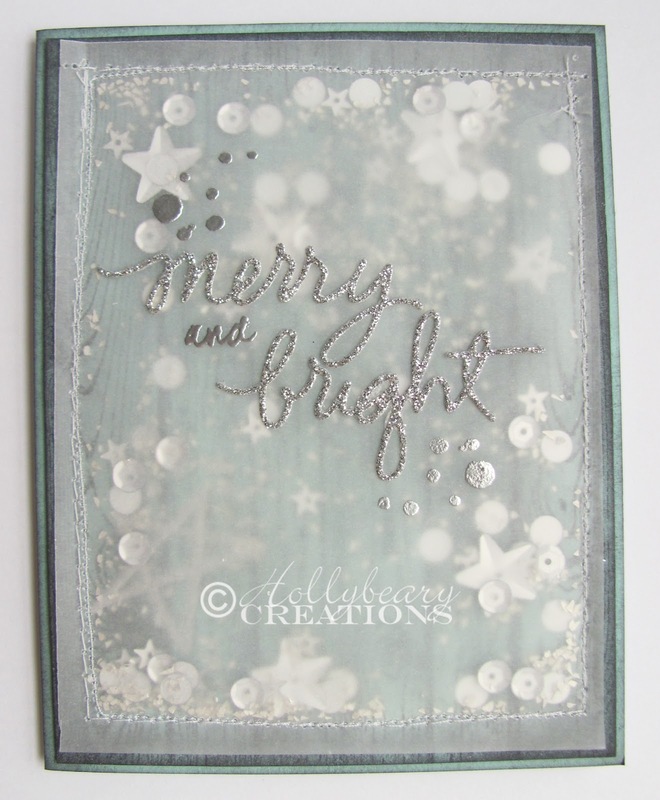 Then I stamped some of the Stars and dots from the Essentials By Ellen set Brushstroke Christmas and embossed them in silver. 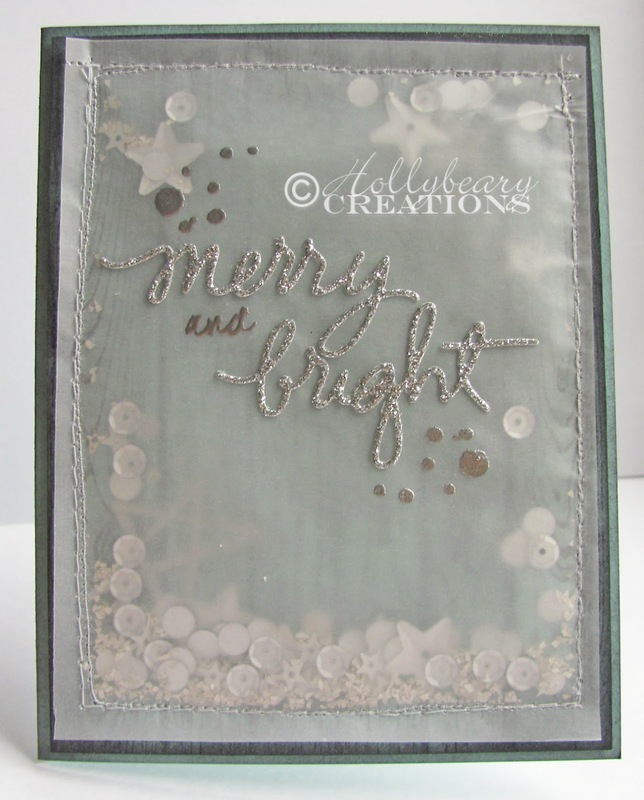 Then I stamped a few more dots and the and from the Merry and Bright onto a piece of vellum paper and stitched it to the front of my pocket. I'm not a person who sews..lol I added in some Pretty Pink Posh Sequins and some Glass Glitter before I stitched it completely closed. 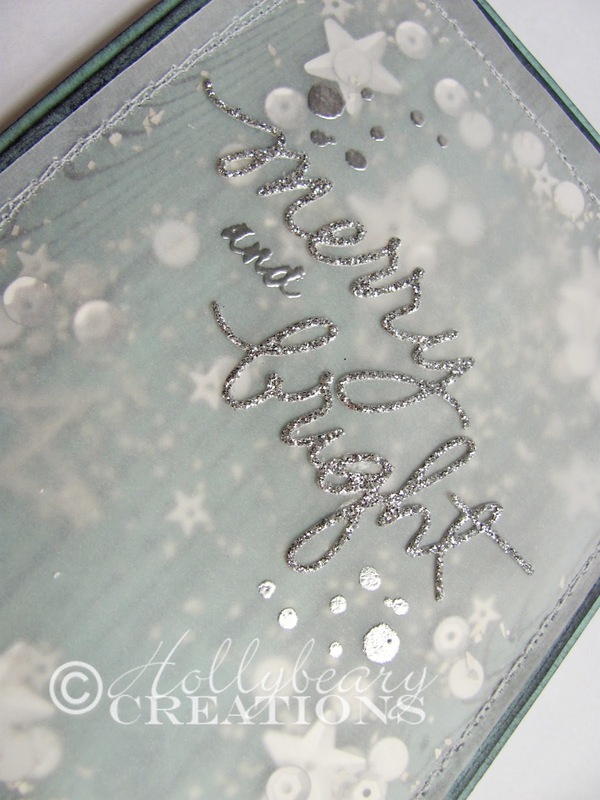 Then I die cut the Merry & Bright from some Silver Glimmer paper, this is the Essentials by Ellen die set called Merry & Bright. Lots of fun words in this die set. I was trying to go for the wood background look you see in the Inspiration photo. But I think I covered it up too much..lol It's always better in our heads how we envision it. Thanks for stopping by.. Head over to the 'Tis the Season blog and see what the other Design Team members created and Link up!!! I think the look you got with your card is fabulous! Love the sewing around the bling inside the vellum. And the die-cut words from glimmer paper look great.